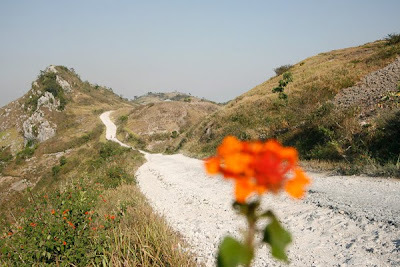 Mountain road near Atsabe, East Timor. 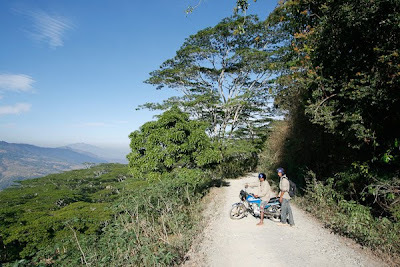 Steep and rough mountain road from the south coast of Timor to the market town Oinlasi. The photo is taken near the highest point at 1100 meters above sea levelTimor, Nusa Tenggara. A chapel in a small village along the Atsabe road in the mountinous interior south of Dili, East Timor. 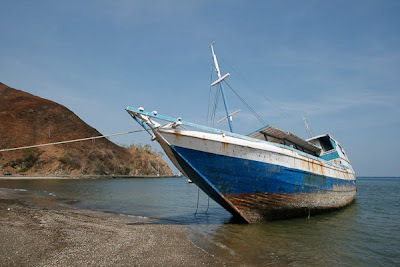 Fishing boat beached at low tide just east of Dili, East Timor (Timor Leste). A Dili taxi driver is taking a break at the beach west of the airport. Dili, East Timor. The beach road east of Dili, on the way to the Jesus statue at Cape Fatucama. Arriving in East Timor is like arriving in an occupied country, but it's not occupied by one single country. The United Nations have occupied the country and it's hard to ignore their presence. Big white SUV:s travel up and down the streets of the Capital (Dili), and the main highway along the northern coast (fewer venture into the mountainous interior and the southern coast). I cycled across the border at Motain/Batugade, and camped and continued slowly along the coast on the way to Dili. There are some beautiful white sand beaches with nothing else than the locals fishing canoes and huts. In the Capital i got my new Indonesian visa at the embassy, then cycled across the mountains to the southern coast. Roads are ok between major towns, but the Atsabe road was in a terrible state, with hardly any asphalt left, steep inclines, bathtub sized potholes, and hardly any facilities. 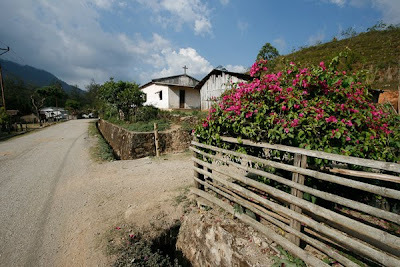 The road goes through a few small villages, but only one or two has a warung (food stall or cheap resturant). There is simply not enough of a local economy to justify it. Small kiosks exist where there may be some instantt noodles, coffee sachets and washing powder. Life is very traditional, which means that men get drunk and play cards, while women work in the small, dry pathches of soil. Timor Leste is an interesting, young little country, but I hope they can get rid of the NGO:s and the UN soon, and be free to create their own economy. The colored crater lakes at Kelimutu, Flores, Nusa Tenggara Timur, Indonesia. Rumors had it that Flores would be tough to cycle on. The Lonely Planet author was writing about razor sharp ridges and v-shaped valleys, and that cycling was not to think about except for Tour de France trainees. There are some sharp ridges, steep mountain sides, and narrow valleys, but it's not extreme in any way, and the main road (and a few others) is paved, and is not too steep when it winds its way up and down mountain sides, over passes, down to river crossings, and along steep sea shores, with hundreds of ravines. I cycled from west to east; Labuanbajo to Larantuka, and had a few days rest in Ende along the way. 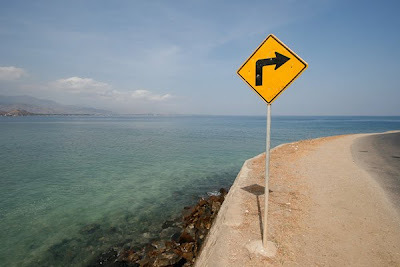 It was four and a half cycling days to Ende, and another three and a half to Larantuka, including the detour to Kelimutu. 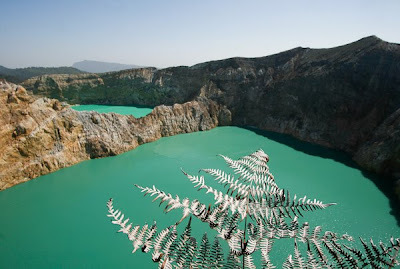 Things to see include the spectacular crater lakes at Kelimutu. The three lakes can be seen from one hill in the middle, and the colors of the lakes are changing color, due to chemical processes in the craters. Unfortunately two of the most beautiful lakes had exactly the same color when I was there. It's possible to cycle all the way up to the parking lot next to the sight, and camp there, as I did. A few ladies walk the 7 kilometers here every morning and arrive at 4.30 a.m. to welcome the tourists with sales pitches for ikat cloth, coffee and snacks. At sunset they walk the same way back with all the unsold stuff on their heads. Snorkeling, swimming and diving is another thing to do around the island. I only had a dip along the road at a small and empty beach to cool off one morning. There are plenty of reefs and white sand beaches visible from the main highway, and a lot more further away, and on smaller islands nearby. Around Bejawa many villages are very traditional, and still use their odd looking houses, and rituals. There are also at least three volcanoes to climb (and many more around the island). The Flores Hobbit, a recent relative to our own species, was found here in a cave. The inhabitants of today look more Malay in the west, and more Polynesian in the east. They are all very friendly and cheerful, and love to see a crazy foreigner cycling through on a bicycle. I was invited to sleep and/or eat with families at several occations along the way.